WIN: MEET LUCY + LOADS MORE! 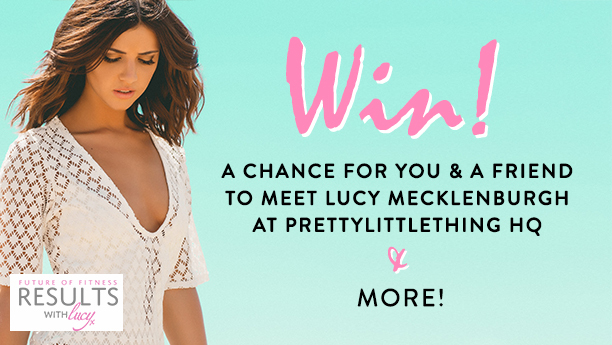 By now you’ve all seen the beaut Wildfire’s & Dream’s starring Lucy Mecklenburgh, well here’s your chance to meet her right here at PrettyLittleThing HQ, AND you can bring you BFF along for the ride! We’re also gonna make sure you’re looking on-point with some killer threads from the collection for you and your best pal, PLUS you’ll always be looking body beautiful with a YEAR’S subscription to Results With Lucy as well! Simply head over to our Instagram or Twitter to enter! Don’t forget to check the T&C’s before entering! 1 x winner plus friend to win.�Winners under the age of 18 must bring an adult as chosen guest.�Proof of age must be presented on arrival, PrettyLittleThing reserve the right to refuse entrants under 18 without adult supervision. Entrants must like graphic, tag friend and follow @officialplt & @resultswithlucy on Instagram to enter. Prize commences 01/07/2015 TBCpm and�includes; meet and greet with Lucy Mecklenburgh, x 1 outfit for winner and guest to the value of �50 each. �Prize includes travel. Winners will be announced via Twitter at and must confirm acceptance of prize within 24 hrs. If winner cannot attend no alternative will be chosen. PrettyLittleThing reserve the right to cancel or alter this competition at any time.